Rhinoconjunctivitis is one common form of allergic condition in adults and children. It is characterised by runny nose, nasal congestion and itchy eyes and nose. Allergy is a genetically predisposed condition while environment plays a part in the triggering of symptoms. 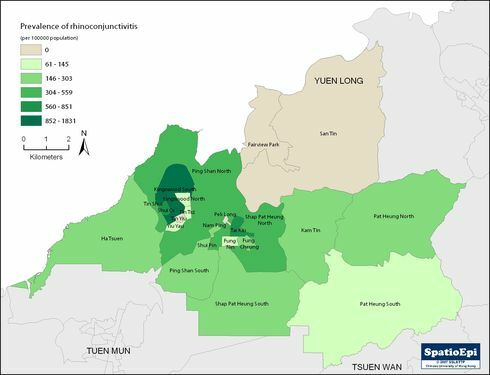 This map shows the varying prevalence of allergic rhinoconjunctivitis in school children of age 13 to 14 in Yuen Long, with Tin Shui Wai showing the highest density. Environmental and socio-economic factors may have played a role in the display of this pattern. Allergy is a disorder of the immune system, which occurs in some genetically predisposed persons with acute attacks triggered by allergen. Common allergies include eczema, asthma, hay fever, food allergies and reaction to venom when stung by insects etc. Allergic diseases can be mild, but can also be life threatening and may lead to death in some patients.